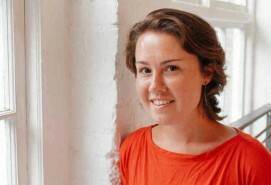 Caroline Adelaide Shaw is a New York-based musician appearing in many different guises. Trained primarily as a violinist from an early age in North Carolina, she is also a Grammy-winning singer in Roomful of Teeth and in 2013 became the youngest ever winner of the Pulitzer Prize for Music, for her enigmatic composition Partita for 8 Voices (also nominated for a Grammy for Best Classical Composition). As a violinist she performs primarily with the American Contemporary Music Ensemble (ACME). Caroline has also performed with the Trinity Wall Street Choir, Alarm Will Sound, the Mark Morris Dance Group Ensemble, the Knights, Victoire, the Yehudim, and many others. (And she has appeared incognito as a backup singer or violinist, on Saturday Night Live with Paul McCartney, on Letterman with The National, on the Tonight Show with the Roots.) Caroline was virtually unknown as a composer before the Pulitzer announcement in 2013, having written only a handful of pieces. While committed to maintaining a busy freelance career as a violinist and singer, performing primarily contemporary classical music, she has taken commissions to create new work for the Carmel Bach Festival, the Cincinnati Symphony, the Guggenheim Museum (FLUX Quartet), The Crossing, the Baltimore Symphony, and the Brooklyn Youth Chorus. Other personal projects include the development of an evening-length theater work, Ritornello, and a slowly-evolving ambient electronic album. Caroline studied for fifteen years with Suzuki violin pedagogue Joanne Bath before working with Kathleen Winkler at Rice (B.M. violin) and Syoko Aki (M.M. violin) at Yale, and she is currently a doctoral candidate in composition at Princeton. She has been a Rice Goliard Fellow (busking and fiddling in Sweden) and a Yale Baroque Ensemble fellow, and she was a recipient of the infamous Thomas J. Watson Fellowship, to study historical formal gardens and live out of a backpack for a year. As a teenager many years ago, she spent a life-changing summer playing chamber music at Kinhaven Music School in Vermont, which is probably why she would prefer to perform barefoot whenever possible. Caroline loves the color yellow, avocados, otters, salted chocolate, kayaking, Beethoven opus 74, Mozart opera, the smell of rosemary, and the sound of a janky mandolin.